In the run-up to writer Brad Meltzer's post-Infinite Crisis relaunch of Justice League of America, he stated in an interview that the JLA would only be facing one new foe. He didn't waste any time, either, introducing us to Dr. Impossible right there in issue #1. Armed with his razor discs, Jonas Lock has the power to break out of anything. Born on Apokolips, Dr. 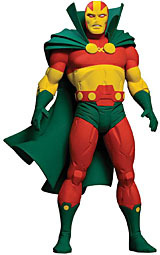 Impossible is the half-brother... brother - no one knows for sure - of Mr Miracle. As Scott Free favored the powers of Highfather, Impossible favored the strength of Darkseid. Always jealous of Scott Free, he swore to forever beat his brother. Rather than be a Mister, he became a Doctor. He still doesn't know how he got to Earth, or became a Penguin goon. All he wants is the truth. Little is known about Dr. Impossible. In fact, that bio has actually given us more info about the character than the comics have yet. Jonas Lock? That name hasn't appeared anywhere else but the back of this action figure, so that's pretty cool. Action figure fans get the scoop! Considering that Mr. Miracle's name, "Scott Free," is a clever pun, "Jonas Lock" is a bit weak by comparison, but at least they tried. The figure looks great. Part of the appeal of Dr. Impossible is that he seems like an old character who hasn't been used in a while, rather than a new creation. The concept of an anti-Mr. Miracle seems just like something Jack Kirby would have come up with, and the character is true to that. The costume is very much a classic Fourth World design, but with some modern sensibilities. It owes a lot to the Mr. Miracle suit, but doesn't directly copy anything. The body of the suit is matte black, while the boots and gloves are gloss. 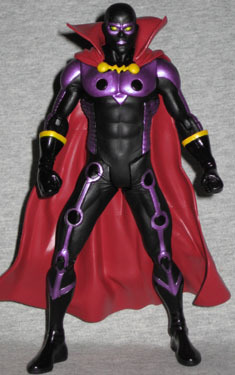 Metallic purple sections run up the front of his legs, around his sides and up his arms and chest. His chest probably wasn't intended to look like an owl's face - just consider that a free bonus. 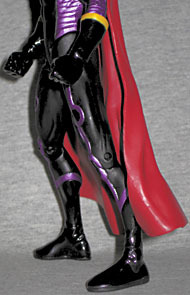 His domino mask and mouth are purple, and his eyes are metallic yellow, more reflective than the trim on his gloves and the clasp on his big red cape. Doctor Impossible was sculpted by Ray Villafane, and he did a nice job. 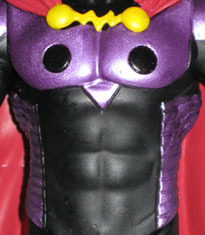 The figure is fairly muscular, but not overly so - he actually looks like he's wearing a costume, rather than like he has black and purple skin. He stands 6¾" tall (when you can get him to stand), and moves like any average DC Direct figure: balljointed head and shoulders, hinged elbows and knees, and swivel hips and gloves. As hinted at above, Doc has trouble standing up for long. If you leave his legs straight, the angle of his ankles leaves him tipping forward; bend his knees, though, and he'll be leaning precipitously back. Once again we have a case where the addition of ankle joints would have saved a lot of headaches. Or just good articulation in general. The best solution so far is to leave one leg straight, have one leg bent, and let him find his own balance. Doctor Impossible doesn't have any character-specific accessories, instead just making do with the same things all the figures in this series have: there's a Justice League of America logo base (the only thing that kept him from actually falling over before I found a good pose), as well as a tiny little Starro. It relates to the story. It's a wee thing, not even ½" across, but detailed and painted very nicely. Shame there's no way for Dr. I. to hold it or anything. Considering that Dr. Impossible was created for the new Justice League of America book, this is the first time he's ever had an action figure. The sculpt and paint are very good, but the articulation is, of course, lacking. Still, if you can overlook that, this mystery villain is worth getting.